We love social features, that’s what makes things go viral. We already got social share buttons and social commenting on your event page. Today, we added one more social feature to the list – display all your Facebook event page RSVP list right on your Eventbee event page. 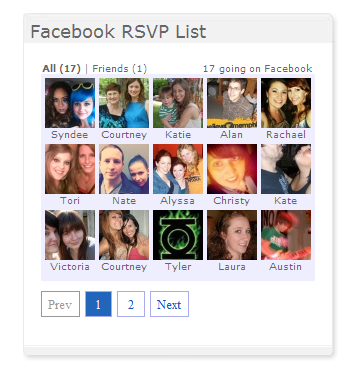 Visitors to your Eventbee event page will know who RSVPed for your event on Facebook, and will also see who among their friends are attending the event. To display this, all you have to do is go to your event manage page, and enter your Facebook eid(event id) in the Customization -> Content section.